Counter Terrorism Department (CTD) Punjab has announced 67 New Jobs in Daily Nawaye Waqat Newspaper 23rd March 2018. Applications from the Desirous for Under Police Department Punjab Jobs 2018 having the required Qualification and Domicile of Punjab Province are invited against the Data Entry Operator Jobs 2018. 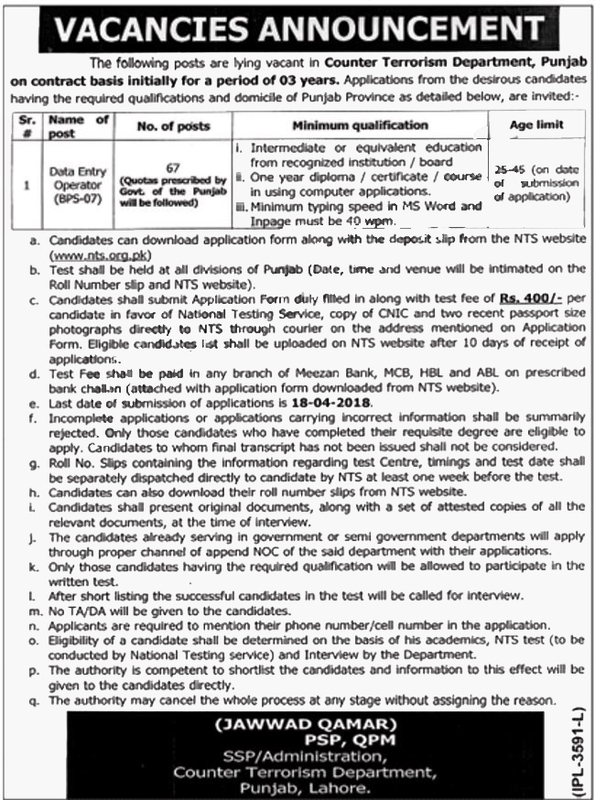 Interested Candidates can Visit National Testing Service Website (NTS) for Download Application Form and Challan Form. The Candidates already serving in Government or Semi Government Department will apply through proper Channel. Incomplete, late received or by hand received application form will not be entertained.